MGM donates MOP300,000 to the Holy House of Mercy’s Welfare Shop project for the sixth consecutive year, financing the distribution of food hampers to more than 360 local disadvantaged households. [April 9, 2018, Macau] MGM donated MOP300,000 to the Macau Holy House of Mercy’s Welfare Shop project, financing the distribution of food hampers to more than 360 local disadvantaged households. Over the past six years in supporting this meaningful project, MGM has contributed a total of MOP1.7 million benefiting nearly 2,000 households. 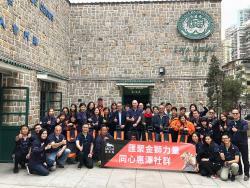 On April 7, MGM’s senior executives led a volunteer team on a visit to the Welfare Shop, where they were warmly received by Mr. António José de Freitas, President of the Board of Trustees of Macau Holy House of Mercy. Mr. Grant Bowie, Chief Executive Officer and Executive Director of MGM China Holdings Limited, presented the donation check to Mr. António Freitas, Ms. Ng Siu Lai, President of Board of Directors of General Union of Neighborhood Associations of Macau, and Ms. Leong Iok Wa, President of Board of Supervisors of Macao Federation of Trade Unions. More than 30 warm-hearted Golden Lion volunteers took part in packing the daily necessities that included rice, noodles, canned food, oatmeal and cooking oil, into MGM’s tailor-made eco-friendly handcarts. These hampers were distributed to the disadvantaged households referred by the Macao Federation of Trade Unions, General Union of Neighborhood Associations of Macau, Associação dos Familiares Encarregados dos Deficientes Mentais de Macau and the Holy House of Mercy. With our vision to Create a Better Tomorrow Today, MGM has been supporting the Welfare Shop project since its launch in 2013, helping to ease the families’ financial burdens and contributing to the continuous improvement of community services for the benefit of the whole society.